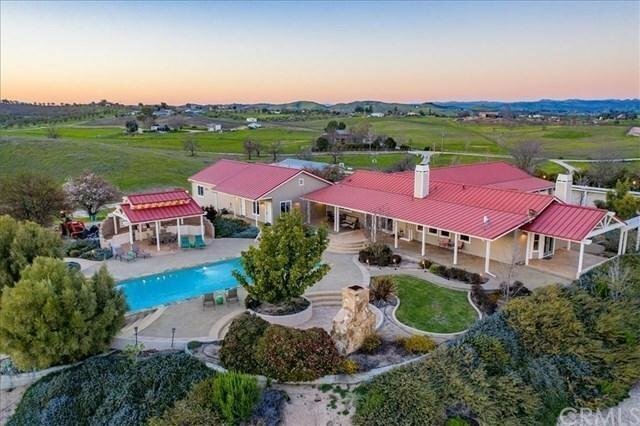 This beautiful contemporary ranch estate is comprised of a 3100 sq ft main house, 450 sq ft guest house, a 1800 sq ft+/- manufactured home and large income producing shop. The main home and guest unit were extremely well built, boasting standing seam metal roofs and hardy plank siding. Inside you'll find beautiful wood floors, vaulted ceilings, custom cabinetry and walls of windows taking in the views. There is an amazing outdoor entertaining area including a large solar heated pool with fountains, large rock fireplace, and covered dining area with double barbeques, refrigerator and sink. Perched at the top of a gently rolling and usable 37+/- Acre parcel located in the Adelaida District, only .5 mile from Nacimiento Lake Drive; this wonderful parcel is NOT in the Paso Robles Ground Water Basin, and therefore is open to your viticultural, equestrian, or other farming adventures. For more details on this magnificent property please see the property website or call for your tour!